In 2017 we have more options than ever before for strong password management. 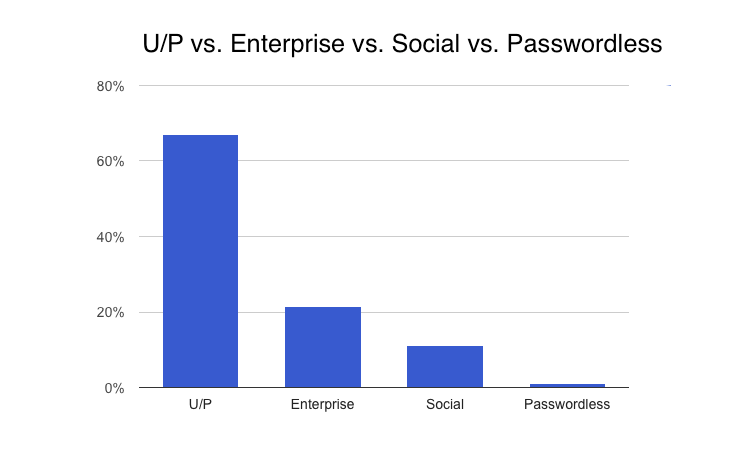 Between social, enterprise, and Passwordless connections, companies that are ready to offer more than username and password have several good options. 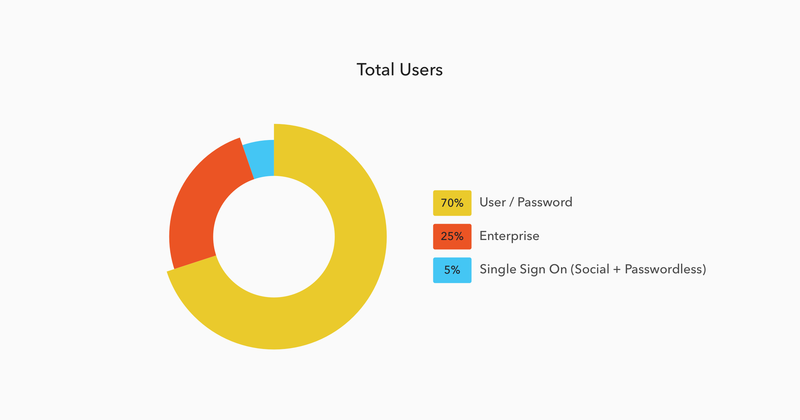 Throughout 2016 we gathered data on how Auth0's users and our user's users were using Auth0. Let's check in on how things are changing, and what's staying the same. Single Sign On (SSO) and Passwordless have been around for a while, even as traditional username and password (U/P) have been around much longer. In 2015 we launched Auth0 Passwordless, which removes passwords from the login process completely and instead uses “Magic Links” sent through email or one-time codes sent through SMS. 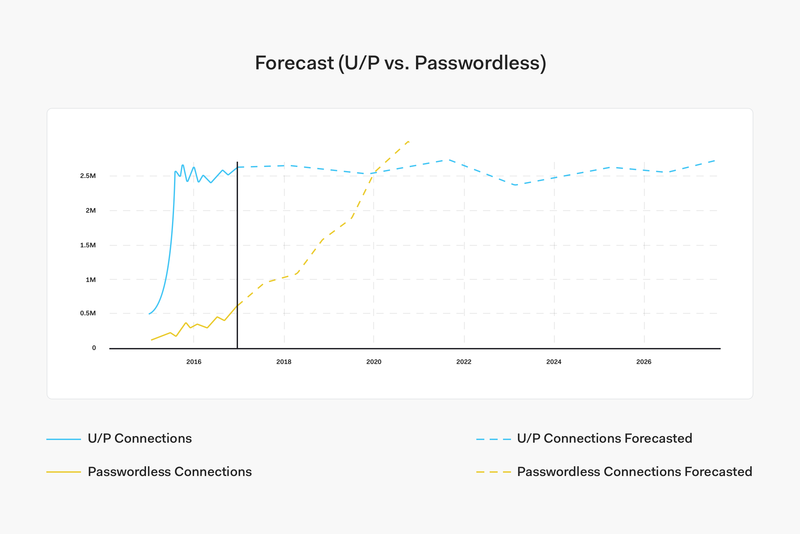 Since 2015 we've seen Passwordless grow at a fairly steady rate of 10,000-20,000 connections per month, though it hasn't yet caught up to social or enterprise login. Social connections have seen a big increase in 2016 and it's easy to see why. Users log into your site with existing login information from a social network provider. It's quick and takes out a lot of friction for the user. 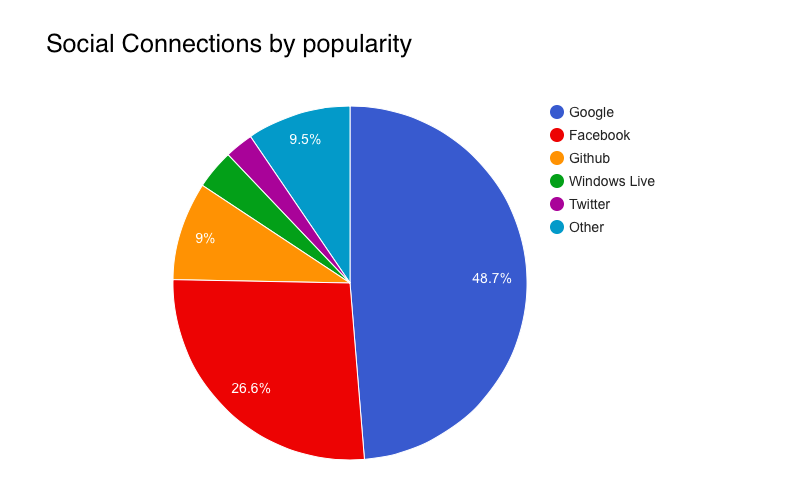 In 2016 Google was the most popular social connection at 48.7%, nearly double Facebook's share at 26.6%. GitHub came in third place at 9% before Windows Live at 3.6%. If you want to personalize your site's experience with social connection, go deeper than Google and Facebook and think about what smaller platforms your users are on. If your users are all developers who are on GitHub everyday, take note of that. If your users are in sales and marketing, have them log in through Salesforce. If they tend towards editorial and publishing, have them go through WordPress. When Will Single Sign On Surpass Username & Password? 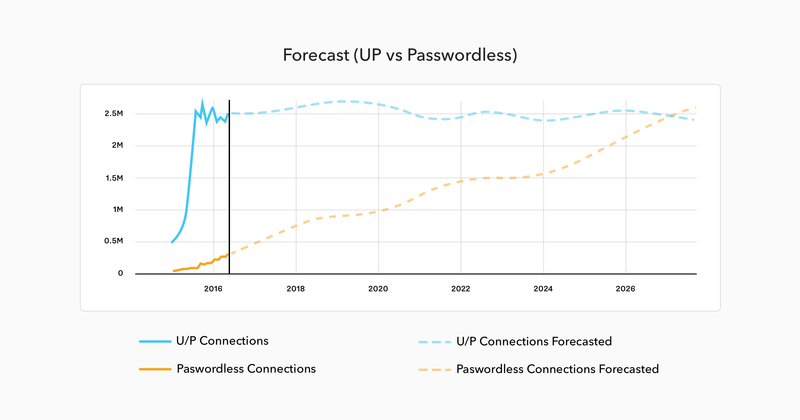 Using our data from 2016, we ran the same growth estimates for Passwordless implementation against U&P and came up with an even more surprising outcome. These numbers may seem startling, but they also illustrate why companies are moving away from U/P so rapidly. Safer, simpler options are available and the industry is having a lot of success nudging users towards social, enterprise, and finally Passwordless options like one-time codes and Magic Links.